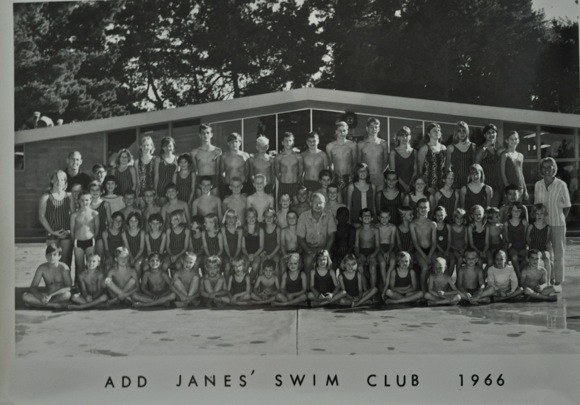 A group of swimmers who hung out at Add Janes Swim School, which was located on Willow Road in Menlo Park, are organizing a reunion for anyone who swam there, whether it was for lessons, on the swim team, or recreationally. We stopped by the Dutch Goose a couple weeks back to talk to the organizers (left to right) Brian Ferrin (breast stroke), Sandy Pachaud, (butterfly), Kathy Baxter Tullus (breast stroke) and Sue Annand Sbardellati (breast stroke). They are leaning toward a Fall event, probably September. To reach other former Add Janes swimmers, they’ve created a Facebook page, where they will be posting reunion details. For those not knowing what an “Add Janes” is, it’s the name of a person. 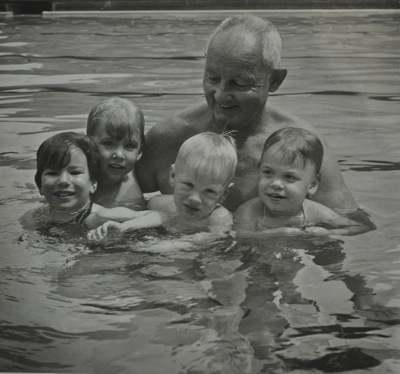 Addison Janes (pictured in the water with children) opened the swim school in 1953 when his closest neighbor was the Foremost-McKesson Dairy. He operated it through 1984. In a touch of irony, two of his management staff, Jeff Lapierre and Carol Ford, (the latter of whom supplied the historical photos), live just a hop, skip and jump from where the swim school once stood. As the reunion gets closer, we plan to talk to them about why Add Janes left such an positive impact on so many lives. I went to Addison’s swim school for several years, around the 1954-56 time period. I learn all my techniques as well as how to compete in the swim meets. Add was a kind and patient man dealing with all those kids. I do believe some of our meets were at Burgess Park if not most of them. If you’re able, you MUST come to the reunion. Love to meet you. Sandra, since I live in another state, it may be difficult for me to attend the Sept.26 event, but I would love to be there. Not sure I would recognize anyone or that anyone would recognize me!!! My Woodside HS reunions were fun for sure! I am in the swim club photo; I was 11 yrs old Wonderful memories. I’m in there too! Sitting right next to Add (on his right). I would have been 15 in the pic. I started out with lessons, was on the swim team, life guarded, and did general maintenance work foe the school. Add, his wife and the staff taught me about work ethic and trying new thing. Add learned to snow ski at 60. Hello Vicky Scalf-Daniels. We were neighbors on Oak Court until 1964. Taught from 1964 to 1973. First row, second from right. Living in Denmark, I’m afraid I missed the reunion news – and therefore the reunion, but recognize with great memories many of the names connected with the swim school and the swim team. Very best regards to you all and to a wonderful legacy! I think the years of our membership would have been as early as 1961 when I was 4 years old. I had attended another swim school prior to Add Janes but don’t know the name. I could dive off of their diving board before I could speak. Have always loved to swim.